← Alabama Kept Doyle Hamm Alive So They Could Legally Murder Him. They told us our distress is due to spontaneous chemical imbalances in our brains. This was promoted largely by pharmaceutical company PR departments rather than by scientists. 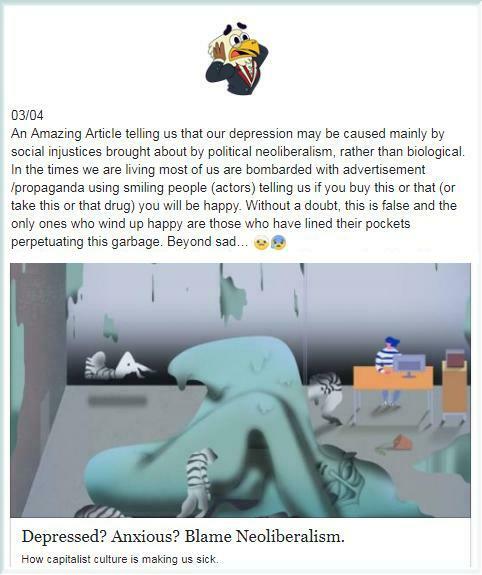 So, neoliberalism makes us miserable by creating a society designed solely for buyers and sellers. Then it uses the pain caused by such a dystopian project as an excuse to tell us our brains are broken and that they’re going to have to sell us even more things—drugs—to fix them. Neoliberalism is distinct from modern liberalism. Both have their ideological roots in the classical liberalism of the 19th century, which championed economic laissez-faire and the freedom (or liberty) of individuals against the excessive power of government. That variant of liberalism is often associated with the economist Adam Smith, who argued in The Wealth of Nations (1776) that markets are governed by an “invisible hand” and thus should be subject to minimal government interference. But liberalism evolved over time into a number of different (and often competing) traditions. Modern liberalism developed from the social-liberal tradition, which focused on impediments to individual freedom—including poverty and inequality, disease, discrimination, and ignorance—that had been created or exacerbated by unfettered capitalism and could be ameliorated only through direct state intervention. Such measures began in the late 19th century with workers’ compensation schemes, the public funding of schools and hospitals, and regulations on working hours and conditions and eventually, by the mid-20th century, encompassed the broad range of social services and benefits characteristic of the so-called welfare state. Neoliberal ideology and policies became increasingly influential, as illustrated by the British Labour Party’s official abandonment of its commitment to the “common ownership of the means of production” in 1995 and by the cautiously pragmatic policies of the Labour Party and the U.S. Democratic Party from the 1990s. As national economies became more interdependent in the new era of economic globalization, neoliberals also promoted free-trade policies and the free movement of international capital. The clearest sign of the new importance of neoliberalism, however, was the emergence of libertarianism as a political force, as evidenced by the increasing prominence of the Libertarian Party in the United States and by the creation of assorted think tanks in various countries, which sought to promote the libertarian ideal of markets and sharply limited governments. This entry was posted in health, Liberal Opinions, politics, Reality vs Tea Party Madness, religion, terrorism, Trump, Uncategorized, World and tagged America, Bill Hicks, Buying, capitalism, culture, In These Times, liberal, libertarianism, Marketing, neoliberalism, Pharma, political, republican, selling, social, Trump, UK, usa, world. Bookmark the permalink.